Pike Perch is the most represented member of this family of freshwater fish in Europe. Its pointed head and long body means it is perfectly designed for rapid movement through the water. Its has numerous teeth and its huge upper jaw reaches behind the eye. Pike Perch can grow to a length of up to 1,30 metres, weigh 10kg and live up to 20 years. 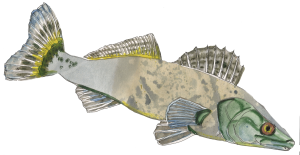 In the morning or evening, the Pike Perch typically hunts near the surface and spends the rest of its time concealed at the bottom. Pike Perch spawn from mid-February to May. After hatching, the young are protected by the males until they are in a position to defend themselves. Already from a size of three to five centimetres, they begin to predatorily feed. Adults feed exclusively on other kinds of fish. Recreational fisheries are of high importance in the Czech Lakes and reservoirs and are in some areas structuring fish populations and fish community composition. In model Lipno Lake anglers make 100000-150000 visits annually.